The cold, snowy weather of Door County in January makes it a great time to highlight what is perhaps the coziest of all of our cabins, the Tamarack Cabin. 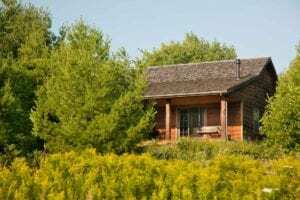 Located across the street from the Guest House and Guest Barn, our cabins and cottages all have a unique style, but the Tamarack is best appropriate for a quiet couple’s retreat. Secluded, yet offering a scenic view of the pond, the Tamarack gives you the privacy you need but allows you to enjoy the winter beauty in warmth and comfort. On the inside, this romantic, one bedroom cabin features a gorgeous cathedral ceiling, accented by hand-hewn oak beams. A double whirlpool tub and gas fireplace ensure a warm and cozy atmosphere. A king size four poster bed provides ultimate comfort for a restful getaway. 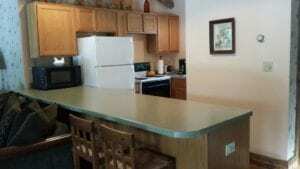 The Tamarack has a fully-loaded galley kitchen, including amenities such as a stove, microwave, dishwasher, toaster, and coffee maker. Whether you decide to stay in and cook or venture into nearby downtown for a bite to eat, you’ll be able to keep everything fresh in the Tamarack’s full-size refrigerator. A beautiful pine armoire hides an entertainment center with TV, Blu-Ray player, and iPod dock for movie nights and musical ambiance. When compared to other offerings in the Door County area, the Tamarack stands out as a cabin that offers real log cabin ambiance combined with modern amenities and clean, luxurious accommodations. Being just one of the fabulous rooms at our Door County Bed and Breakfast means you’ll get our fantastic service and amazing breakfast, and enjoy Door County winter on your terms.